Production: Warner Bros. First National (USA), Tobis Klang-Film, and Nero-Film (Germany); black and white, 35mm; running time: 111 minutes (German version) and 104 minutes (French version); length 3097 meters (German version). Released 19 February 1931, Berlin. Filmed in Berlin. Producer: Seymour Nebenzahl; screenplay: Leo Lania, Bela Balàsz and Ladislaus Vajda, from the play by Berthold Brecht; adaptation for the French version: Solange Bussi, André Mauprey, and Ninon Steinhoff; photography: Fritz Arno Wagner; editors: Hans Oser (German version), Henri Rust (French version); sound: Adolf Jansen; production designer: Andrei Andreiev; music: Kurt Weill; orchestration: Theo Mackeben. Valeska Gert ( Mrs. Peachum ); Lotte Lenya ( Jenny ); Hermann Thimig ( Vicar ); Ernst Busch ( Street-singer ); Vladimir Sokolov ( Smith ); Paul Kemp, Gustav Puttjer, Oskar Höcker, and Kraft Raschig ( Mackie's Gang ); Herbert Grünbaum ( Filch ); French: Albert Préjean ( Mackie Messer ); Florelle ( Polly ); Jack Henley ( Tiger Brown ); Gaston Modot ( Peachum ); Jane Markem ( Mrs. Peachum ); Margo Lion ( Jenny ); Antonin Artaud, Vladimir Sokolov, and Merminod ( Mackie's Gang ). Lania, Leo, Bela Balasz, and Ladislaus Vajda, Die Dreigroschenoper , in Masterworks of the German Cinema , edited by Roger Manvell, London, 1973; also published separately, Berlin, 1978. Joseph, Rudolph, editor, Der Regisseur: G. W. Pabst , Munich, 1963. Buache, Freddy, G.W. Pabst , Lyons, 1965. Amengual, Barthélemy, Georg Wilhelm Pabst , Paris, 1966. Aubry, Yves, and Jacques Pétat, "G. W. Pabst," in Anthologie du cinéma 4 , Paris, 1968. Masterworks of the German Cinema: Nosferatu, M, the Threepenny Opera , introduction by Roger Manvell, New York, 1973. Atwell, Lee, G. W. Pabst , Boston, 1977. Chavance, Louis, "Un Mystérieux Musée de figures de cire," in La Revue du Cinéma (Paris), 1 May 1931. New York Times , 18 May 1931. Variety (New York), 20 May 1931. Close Up (London), June 1931. Bachmann, Gideon, editor, "Six Talks on G. W. Pabst," in Cinemages (New York), no. 3, 1955. "Special Issue" of Filmkunst (Vienna), no. 18, 1955. Seitling, Mark, in Films in Review (New York), August-September 1960. Croce, Arlene, in Film Quarterly (Berkeley), Fall 1960. Stanbrook, Alan, in Films and Filming (London), April 1961. Tyler, Parker, in Classics of the Foreign Film , New York, 1962. Luft, Herbert, "G. W. Pabst," in Films and Filming (London), April 1967. Brecht, Bertolt, and V. Gerhage, "Het Driestuiversproces—een sociologies experiment," in Skrien (Amsterdam), November-December 1973. Rayns, Tony, in Monthly Film Bulletin (London), July 1974. Pitera, Z., in Kino (Warsaw), August 1976. "Special Issue" of Avant-Scène du Cinéma (Paris), 1 December 1976. Horak, J. C., "Three Penny Opera: Brecht vs. Pabst," in Jump Cut (Chicago), no. 15, 1977. Virmaux, Alain, and Odette Virmaux, "L'Affaire: Quat sous de dommages et intérêts," in Cinématographe (Paris), December 1986. "Cinema and Opera Issue" of Avant-Scène du Cinéma (Paris), May 1987. Film Dope (Nottingham), April 1994. Löser, Claus, "Ein ehrenvolles Schicksal," in Film-Dienst (Cologne), 7 November 1995. Mahrenholz, S., in EPD Film (Frankfurt), November 1995. Kemp, Philip, "Mud in Your Eye," in Sight & Sound (London), October 1998. G.W. Pabst's film version of Bertolt Brecht and Kurt Weill's The Threepenny Opera is a fascinating though flawed curio. The property, initially presented on the stage in 1928, is an adaptation of John Gay's The Beggar's Opera , a parody of Italian musical dramas first performed 200 years earlier. While Brecht retained the basic plot of The Beggar's Opera , he updated it and related the satirical elements to his own era. At the same time, he was concerned more with ideas than coherent storyline or character development. In cinematizing the play, Pabst treated the plot and characters far more realistically, with greater emphasis on the feelings and motivation of the principal roles; in this regard, the film bears more the mark of Pabst than Brecht or Weill. The sets, lighting and props are very stylized (except for the sequence detailing a beggar's demonstration) resulting in an odd conglomeration of surrealism and reality. Brecht originally collaborated on the film, but the script was rewritten when his ideas clashed with those of Pabst. Brecht and Weill were displeased with the filmmaker's interpretation, and took out a lawsuit over the material's copyright. Brecht's social satire is still preserved though, along with this unaffected lyricism. The theme is as relevant to the present as to 1928 or 1728: the government and the underworld are as equally amoral in terms of self-interest. A once orderly world—which may only exist in the fantasies of those nostalgic for the "good old days" that in reality were never really so good—has been polluted by economic and political chaos. The setting is a dreary Victorian London of pimps and prostitutes, thieves and killers, and crooked politicians. ( The Threepenny Opera was banned in London after a single showing). Polly Peachum, with the members of Mackie Messer's gang, opens a bank, in the belief that "honest" thievery is more profitable than larceny outside the law. In the end Polly's father (who is king of the beggars), Tiger Brown (the corrupt police commissioner), and Mackie become partners in the bank—and mainstays of society. Weill's songs, so important in the stage production, seem less so here: some—"Ballad of Sexual Dependency," "The Tango Ballad," and "The Ballad for the Hangman"—were omitted by Pabst. On one level the film is difficult to evaluate because current prints are faded; and the soundtrack seems archaic because of the technology then available for recording dialogue and music. But the disunity of style (a fault) and the keenly realized satire (an asset) are both lucidly apparent. The Threepenny Opera is one of a trio of films Pabst directed in the 1930s that were anti-capitalist, stressing the importance of friendship and the moral obligation to oppose the forces of evil. The others were Westfront 1918 and Kameradschaft. Though The Threepenny Opera is far more romantic and stylized than the first two, all are united thematically. The film was released on the eve of Hitler's seizure of power in Germany. Pabst captured the essence of the atmosphere which allowed the existence of the Nazi state, and all original German prints were destroyed by the Third Reich. 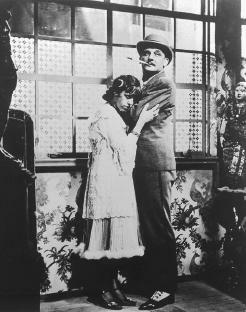 The film was shot simultaneously in both German and French, with different casts; the French Threepenny Opera became a success in Paris, and was hailed as a masterpiece, but the German version is more well-known in America. A complete negative of the latter was reconstructed by film distributor Thomas J. Brandon in 1960, after a decade-long search through Europe for sections and scenes.